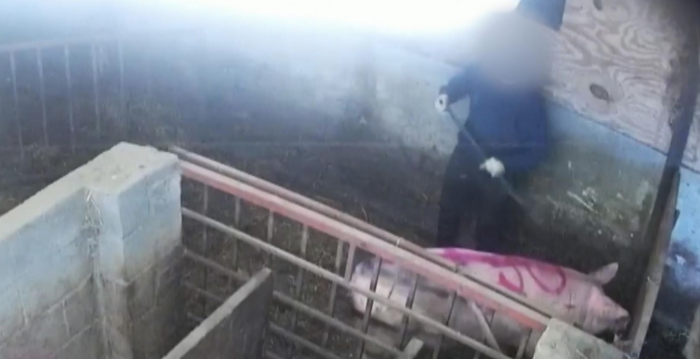 Four workers have been sacked after secretly taken footage shown on Sky News today showed pigs being mistreated at a Lincolnshire farm. The footage, taken in April by campaign group Animal Equality, includes pigs being kicked in the head, hit with gates and jabbed with pitchforks. The Godfrey family, who own the farm, along with the company Elsham Linc Ltd, told Sky News: “We are shocked by the actions of those involved as their abhorrent behaviour does not represent our business. We are a family run farm where the care and welfare of our pigs is paramount. The NPA has issued a statement to Sky News, describing the actions of the workers as ‘indefensible’ and welcoming the responsible action of the business in sacking them. “The NPA does not tolerate or condone violence or cruelty towards animals in any way; we are clear that the actions of the individuals depicted in the footage are indefensible and should be treated accordingly,” it said. “The NPA added that it would take the lead in investigating what further measures can be put in place to prevent any similar incidents from occurring on British pig farms. The Government and the RSPCA are now investigating, according to Sky News, which also quotes a Professor of animal welfare at Cambridge University, Donald Broom, claiming the UK has lost its position as a world leader in animal welfare. The Sky reporter said the footage raised questions about ‘where the pigs that make our bacon come from and how they are being treated’ as Defra Secretary Michael Gove looks to restore the UK as a leader in animal welfare. The feature also raises the issue of how labelling can be confusing when it comes to how pigs are reared, including when pork is imported.